A bedtime tale: Once upon a time, there was a girl who published a lovely little food blog and had many delightful conversations with readers about incorporating good food into their busy lives. Then the girl’s job kicked into extreme overdrive, ratcheting from ridiculously busy up to holy-hyper-insanity-what-do-you-mean-it’s-already-June-July-August busy. 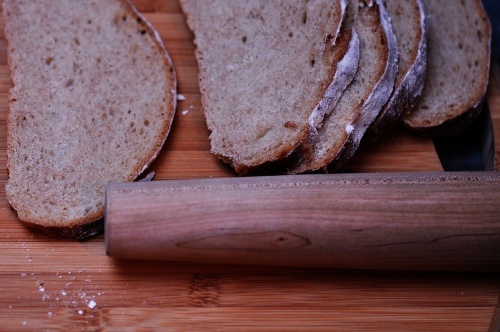 It was so busy that the girl could barely manage to cook food every night, let alone photograph it and write about it. Then the girl’s grandma died. Then her job got even busier. One day, the girl decided she really missed blogging and decided to come back to it with a recipe for absolutely perfect chocolate chip cookies. The end. Or something like that. Thank you for bearing with me during my unplanned hiatus. I missed you guys - I hope you missed me, too. The past few months have been absolutely breathless; as it turns out, there is a monumental amount of work involved in being debtors’ counsel in a large chapter 11 bankruptcy case. Who knew? To atone for my absence, I present to you my very favorite cookie. 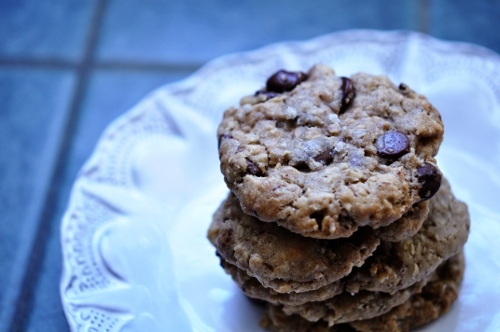 As I have mentioned, I grew up making a scrumptious snuggle of an oatmeal chocolate chip cookie known in my family as a Cowboy Cookie. For the better part of three decades, I considered Cowboy Cookies to be the Mary Poppins of chocolate chip cookies: practically perfect in every way. And then, one day, I cheated on my Cowboy Cookies with another recipe involving brown butter. For the uninitiated, brown butter is the result of heating regular butter in a skillet until the water has boiled off and the milk solids brown. It is rich, nutty, and capable of becoming an absolute scene-stealer in otherwise predictable dishes. Jeffrey Steingarten wrote about brown butter in the June issue of Vogue last year. (Wherein he had the bizarre nerve to present an utterly pedestrian oatmeal shortbread recipe as the end-all, be-all oatmeal cookie whilst neglecting to include the baking temperature. Jeffrey, I expected better on both counts.) My quibbles with the recipe notwithstanding, the story reminded me how beautifully brown butter enhances certain cookies. Unsatisfied with my underlying recipe, I filed the brown butter idea away in a special section of my memory I reserve for Thoughts About Cookies. A few months later, I was intrigued by the idea of putting grey salt on chocolate chip cookies. A few months after that, I received The Grand Central Baking Book for Chanukah and the stars were suddenly aligned for cookie nirvana. The six-year-old in me thought this departure from Cowboy Cookies was utter heresy, but the 30-year-old who occupies the majority of my me-real estate told the kid to simmer down and have a nap. 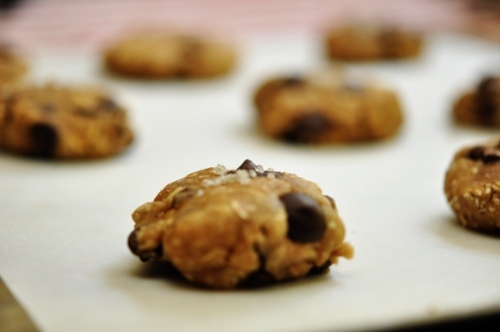 And then promptly set about combining all of these recipes into one perfect cookie. 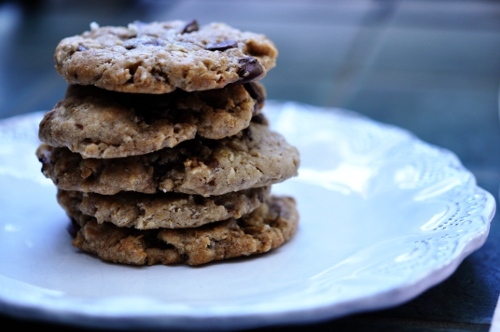 A soft, chewy, perfect cookie that is both loaded with chocolate and tastes faintly of toffee. Robust with oatmeal and very grown up with a smattering of grey salt, it is a moment of baked perfection in even the most hectic life. In the year or so since I started The Salty Spoon (oof, has it been a year? a blogoversary celebration is surely in order here, too! ), I have had the wonderful fortune to interact with a talented and enthusiastic bunch of like-minded cooks, readers, eaters, and otherwise interesting people. Some have blogs, some don’t. Among the food blogs I’ve discovered in the past year, Megan Fizell’s Feasting On Art is one of my favorites. If you aren’t familiar with this wonderful site, go immerse yourself in the archives for a bit and come back once your socks have been thoroughly knocked off. The concept is so delightful, I continually kick myself for not having thought of it. Megan begins with a still life painting, adds a narrative about the style and the artist, then follows with her own recipes and photographs. The dialogue she creates between the food and the images is simply brilliant. It just so happens that I, too, have a degree in art history and a soft spot for the still life genre. When Megan announced a recipe contest to celebrate her blog’s upcoming one-year anniversary, I was giddy. 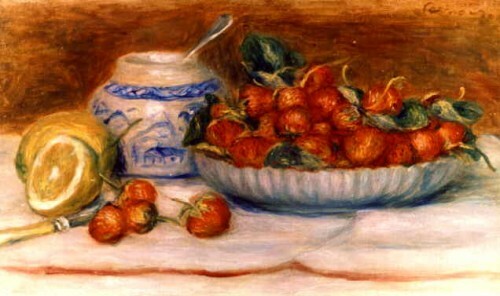 We begin with a Renoir, which presents the contest’s required ingredients: strawberries and lemons. 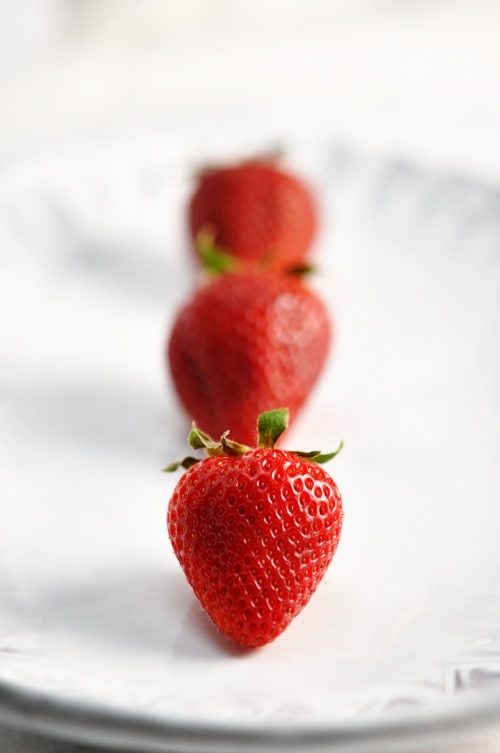 Ripe strawberries are typically used in ways that showcase their exuberant sweetness. 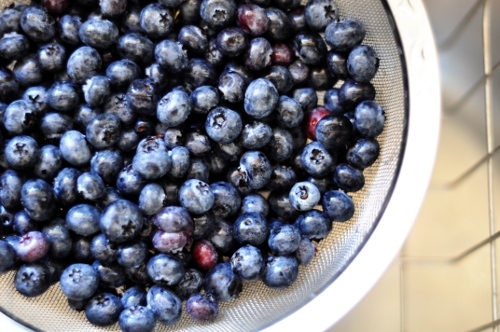 I wanted my recipe to feature more of their depth, their essential berry-ness. I turned to my trusty Flavor Bible and pondered the combination of strawberries, wine, and black pepper. Gnarly Head Zinfandel is a bit of a ubiquity in my kitchen right now, and I knew its own berry notes would complement the strawberries while its dryness would temper their sugar. The pepper was a gamble, but I think it works. It brings a bite and sizzle to the dish without being overly precious in its contrast. The bit of maple syrup at the end counters any lingering bitterness from the wine without upping the sweetness too much. The pound cake is simple as simple can be. 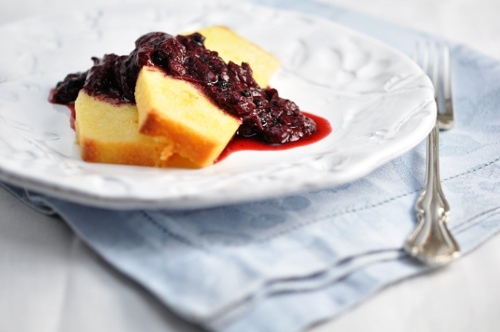 Buttery, tender, and gently flavored with lemon, it ably balances the compote’s wild side. 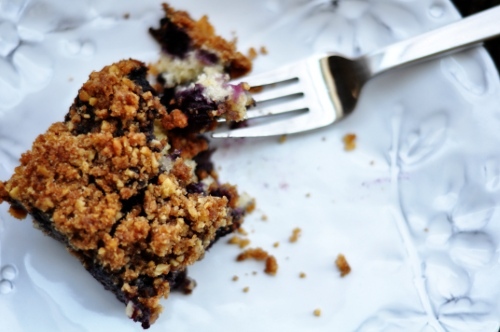 For my non-sweet-loving dessert-eaters, this dish will not disappoint. We enjoyed generous helpings beneath the glow of newly installed tiki torches, in our little backyard with friends. The crisp night air surrounded us as we sat by the garden smelling the freshly turned dirt, and our dessert was intriguing enough to make me forget that my arms felt like they were about to fall off (the result of having planted 26 flowers and shrubs in said freshly turned dirt the day before). I’m not going to go so far as to say this dessert has the power to relieve pain, just that you’d be amazed what a few peppercorns can do to keep your mind occupied. If the idea of about eating whole peppercorns causes you stress, tie them in a bit of cheesecloth and discard at the end. I happen to think it’s rather fun to find one amidst my cake-eating frenzy (because I can’t do anything but gobble this stuff down) but your mileage may vary on this one. After 30 years of utter nonchalance on the matter, I am suddenly interested in gardening. 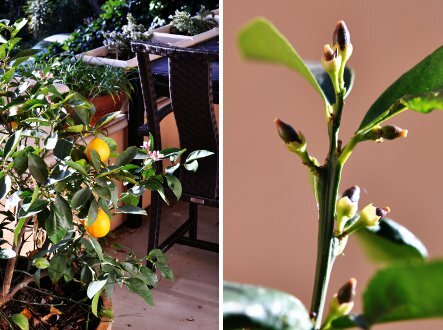 It started with a little lemon tree. 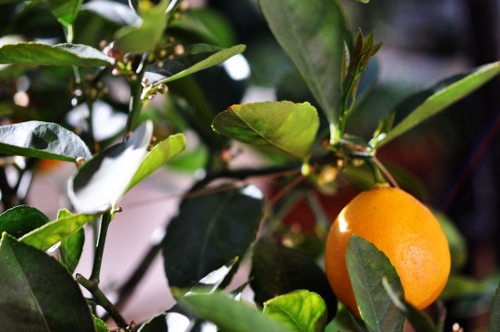 A dwarf Meyer lemon tree that arrived one misty morning in February groaning under the weight of two dozen ripe lemons. 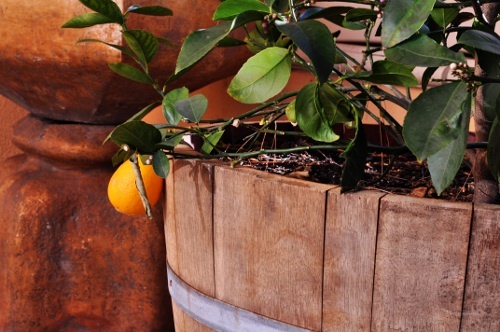 The lemon tree was part of a patio redesign project we just finished. After two and a half years in the house, it seemed like a fine time to actually do something more substantial with the front patio than the occasional sidelong glance while muttering “we oughta get a table or something…” The front patio project spilled into the side yard and then to the back patio; after next weekend, we’ll have it all planted and ready for a good growing season. There are tomatoes. There are fuschias. There is a potted hedge of blossom-studded rosemary. The camelias and azaleas and Japanese maples are on their merry way. I can’t wait. Back to that tree. After the sixth day of making John crazy with an endless chorus of “my lemon has a first name, it’s M-E-Y-E-R, my lemon has a second name, it’s M-E-Y-E-R!” (thank you, Derek, for gracing me with this horrible earworm), I sobered up and faced the inevitable question peeking in my patio door: what the hell do we do with all these lemons? It wasn’t so difficult. Their thin, supple skin is most conducive to zesting, while their (relatively) mild acidity makes the flesh and juice a handsome complement to sauces, dressings, relishes, and, in a pinch, water. I’m still working out the proportions for a lemon sage vinaigrette we’ve been enjoying mightily on all things green and leafy. In the meantime, I’m tremendously excited to share this cookie with you. 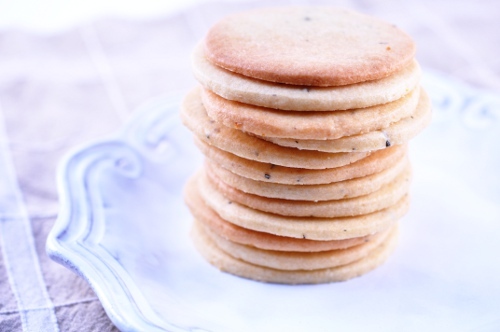 If you haven’t ever tried rosemary in your baked goods, you are missing out. I find it brings a big, round flavor to sweet things while tempering the pointedness of the sugar. This is the cookie for people who, inexplicably, roam in search of desserts on the low end of the sweetness spectrum. The proportions of lemon zest and rosemary are a starting point. Make a batch and see how they strike you, and increase as you see fit to suit your taste. The rosemary’s strength will surprise you, so don’t haul off and mix in half a cup. Start small and work up from there. 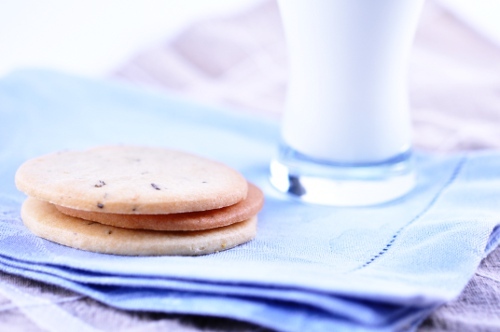 We’ve been enjoying these cookies without any on them, but they would be lovely with a light buttercream or sandwiched together around a bit of lemon curd. If you can’t find Meyer lemons in your area, regular lemons will work fine. Look for the ripest ones you can get your hands on: thin skins, bright yellow, and fat little bodies. Shortly before our tree arrived, I found a bounty of Meyers at Costco. While picking my carton, an elderly woman next to me pondered the label, unconvinced that they were worth a try. I piped up, noting that the flesh was sweeter than a traditional lemon and that the peel was also wonderful. “They’re wonderful with tequila?” she exclaimed, having misheard my comment about the peel. I started to correct her, but decided against it when I saw how her eyes sparkled at the idea. “Yep,” I said, “great with tequila.” That sold it; into her cart they went. Can we talk for a moment about the irresistible scent that apples and cinnamon drape across a kitchen as they cook together? It’s unbeatable. The sweet, tart brightness of a good apple and the nose-tingling cha-cha-cha of potent cinnamon cradle each other carefully, gently. I can understand why Glade and its ilk are constantly trying to make scents that go by the name apples and cinnamon, though we all know they are, in fact, kidding themselves. I used to make myself the most ridiculously pared-down versions of an apple crisp as afternoon snacks in law school. No measuring, just a heap of apple slices, oatmeal, brown sugar, cinnamon and butter in a little dish in the microwave. It’s especially silly for me to call them apple crisps, because there was nothing crisp about them. Just sweet, soggy oats and squishy apples. Apple soggies. But the smell, oh, the smell. Once, when my apartment was being shown to a prospective tenant for the following year, I managed to time one of these little bowls to come out of the microwave just as the landlord was knocking on the door. The prospective tenant ended up not taking the apartment, but I think she seriously contemplated asking if she could come back for a snack the next day. 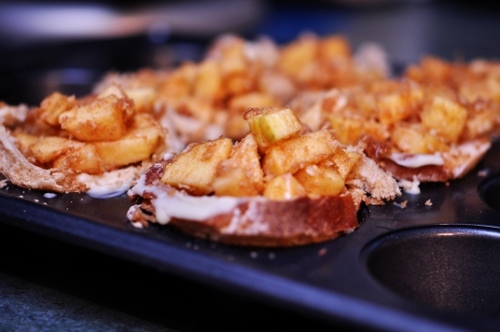 My little apple soggies weren’t perfect, but they fit a special kind of dessert bill. They were quick, delicious, and brought a minimal assault against any ideas I might have had about eating healthfully. Since then, I have graduated to the glorious realm of the diminutive apple brown betty. I love their simplicity. 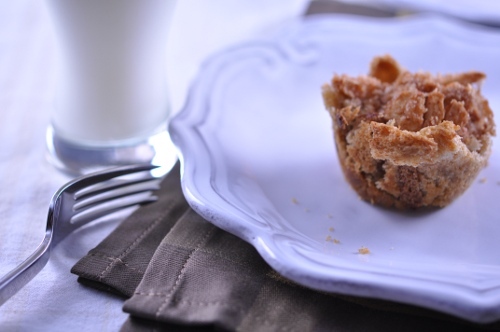 Nothing too fancy or trussed up, just lightly seasoned apples in a crisp, buttery crust. You can take them from pantry to oven in less than 15 minutes (depending on your apple peeling skills). Best of all, they will fill your kitchen and any adjoining rooms with that tremendous apple cinnamon scent. 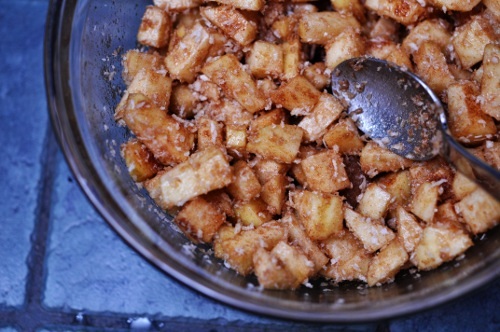 Use your best cinnamon, a few good apples, and you’ll be in business. 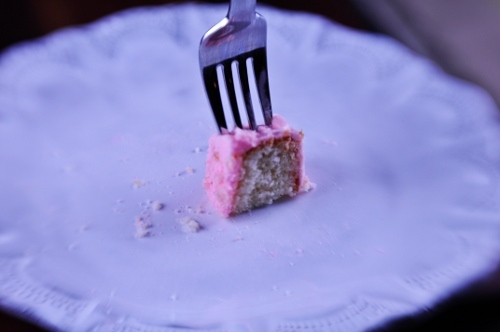 About a year ago, I blew out a candle on a piece of white cake with pink frosting, my standard birthday fare. I made a wish. I wished that I would have the inspiration, time, and wherewithal over the coming year to figure out a way to bring my writing and cooking together into a big, lovely project. I wished for a way to begin building an audience of readers with whom I could share my love of food, cooking, and a few stories along the way. In effect, I wished for all of you. We have just finished off another white cake with pink frosting. Why so simple, you ask? Though I like to think of myself as a reasonably seasoned baker, I never go with anything fancy or new or complicated for my own birthday. The white and pink combination is something I fell in love with when I was very small - somewhere in that post-toddler epoch that finds so many little girls swaddling themselves in billows of pink everything. I think it also has something to do with having a December birthday. Once Thanksgiving comes and goes, the default thinking behind every decorated cake seems to begin and end with wintry/Christmas things until February comes along with its shower of red and pink clashiness. Somewhere along the way, I came to prefer a cake that didn’t have anything to do with the season. 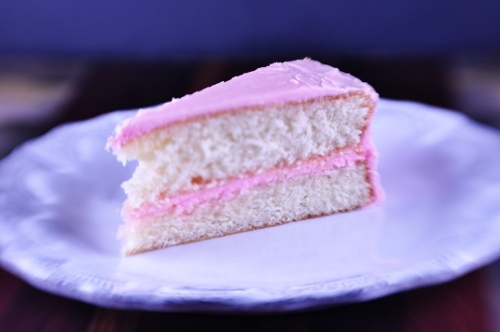 To me, a stripe of pink frosting between layers of fluffy white cake just screams BIRTHDAY and nothing else. 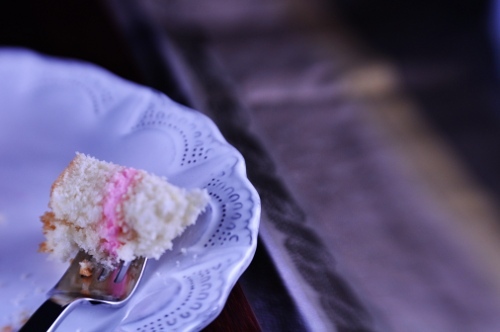 Though I have been known to take my birthday cake in a chocolate direction (the recipe for which I must share with you soon, because it’s a real charmer), more often than not I find myself coming back to my favorite pink and white number. The cake itself is just plain perfect. Not only does it turn out beautifully every time I make it, you cannot find an easier recipe to execute. Dump, mix, dump in the eggs, mix again. I can barely justify a rundown for this one because it’s so incredibly simple. Several years ago I looked and looked for a recipe that would give me a simple white cake with a tiny, moist crumb. A few mediocre misfires lead me back to the Betty Crocker Cookbook, one of my kitchen’s secret weapons. Straightforward, comprehensive, and full of helpful tables and asides, it is an invaluable resource for understanding cooking basics. Plus, it’s ring-bound, which allows it to lie flat on your counter. If you are ever looking for a cookbook that can act as a starting place for someone new to cooking, this is it. My mom gave me a copy when I moved into my first apartment, and I refer to it at least once a week. My copy is visibly well-loved and some of the pages have acquired dribs and drabs of their recipes, not the least of which is the page facing the recipe for this cake. Back to that wish. Tonight, my lovelies, I want to take a moment to thank you for being a part of this little blog of mine. Over the past several months I have had the wonderful privilege of sharing my recipes, photos, and ramblings with you. It has been a pleasure to read your comments, your emails, and share this wonderful journey through our kitchens together - over 7,000 kitchens to-date. I can’t begin to tell you how honored I am to be part of your virtual food milieu. Your willingness to return week after week is one of the best, most exhilarating gifts I have ever received. Thank you. I’m not sure why I decided cinnamon rolls would be my Everest during the three weeks between graduating from college and starting my first real job, but I did. It was one of several projects I took on when faced with twenty empty days (the others being unpacking, sleeping in, and adopting a kitten previously rejected by Satan as being “too evil”). I wanted to find a recipe for really excellent cinnamon rolls. It had to deliver reliable, wonderful rolls every time, the kind of baked treasure that stops people in their tracks, wide-eyed and momentarily overwhelmed, before they exclaim WOW. The first three recipes were unremarkable. They were too tough, too sweet, too boring. Something was fatally wrong with each one, and I began to get discouraged. I came upon a fourth recipe. Despite my skepticism, I dove in, pausing to figure out what it meant to scald the milk. 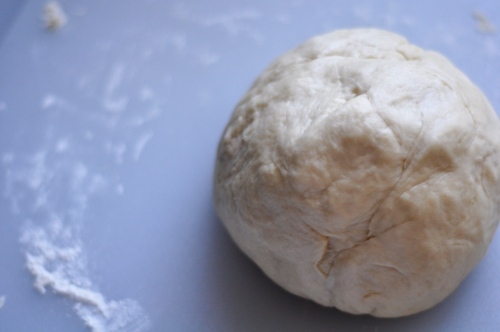 The dough was smooth and satiny. It filled my tiny kitchen with a sweet, yeasty penumbra that sent little jolts of hopeful electricity into my dwindling expectations. I briefly lamented my lack of a rolling pin as I coaxed the dough into a large rectangle with a wine bottle covered in plastic wrap. It scarcely mattered that I couldn’t get it very even. 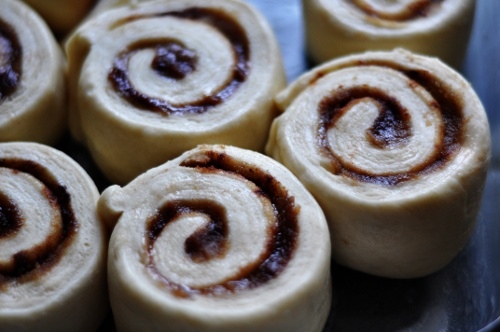 The dough welcomed its thick mat of butter, brown sugar, and cinnamon with aplomb. 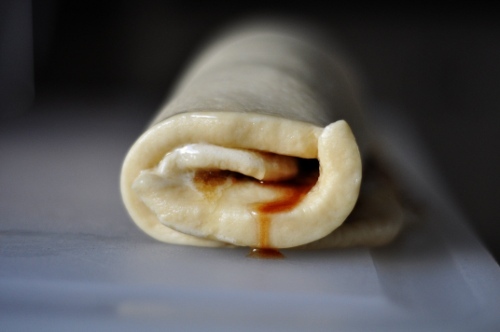 I rolled it into a drippy, burgeoning tube, slicing it into a dozen syrupy disks that made their way into a cake pan. After the second rise, I was astounded to see that the rolls had truly doubled in size. What had once come close to loosely filling the pan was now threatening to rise up and leave altogether. Surely, this was a sign of good things to come. At the risk of sounding hopelessly twee, I will admit that I cried when I took my first bite of one of the rolls. Piping hot, silky, and feather-soft, it was like biting into a cloud in the version of heaven where everything is made of pastry (don’t tell me I’m the only one who has had that awesome dream, right?). After regaining my composure, I loaded up a plate with a few more rolls and settled down on my futon to watch an old favorite, Green Card. It occurred to me, as Andie McDowell and Gerard Depardieu acted out the lighter side of immigration fraud to the sounds of Enya, that I had something truly wonderful in my possession. It remains among my very favorite recipes, both to make and to share. I have made these rolls in good times and bad. I have made them for coworkers, for friends, for family, and for strangers. I have made them with the full arsenal of a commercial kitchen and, most humbly, with a wooden spoon and a large pot. Because they are a sure-fire crowd pleaser and require absolutely minimal equipment, I highly recommend taking the recipe with you when you travel. You will be the houseguest who always gets invited back. 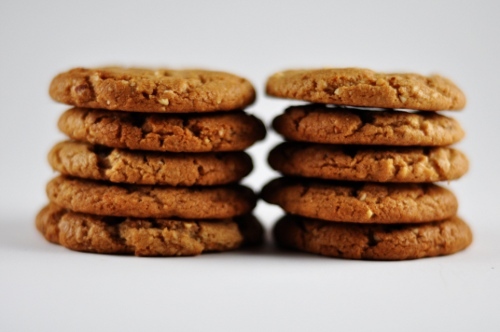 Peanut butter, your cookie reign has come to an end. Drop whatever you are doing and get a jar of almond butter, lovelies; a cookie revolution has begun. Aside from the general avoidance annoyance inherent to any food allergy, I don’t feel like I miss out on very many things due to my inability to eat peanuts. True, peanut M&Ms were tough to give up at first (I didn’t figure out I was allergic to peanuts until I was in high school), but I rarely lament my inability to indulge in the world of everyone’s favorite salty legume. 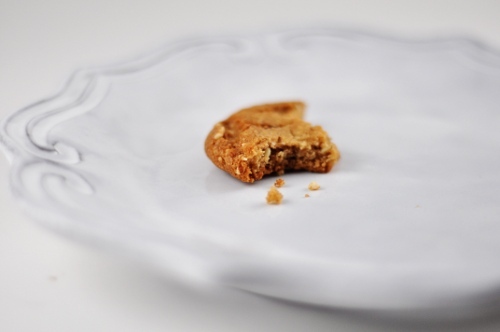 Except that every so often I really miss peanut butter cookies. The rich, salty ombre of the peanut butter brings a toasty mellowness to an otherwise basic cookie dough in a way that I always found quite irresistible. Once, one of my dad’s coworkers gave everyone in their department a tin of peanut butter chocolate chip cookies and I thought I might keel over and die with happiness. They were, in a word, awesome. So awesome, in fact, that I find myself thinking about them every so often. In thinking about those crazy, wonderful cookies the other day, I realized that I have never tried substituting almond butter for peanut butter in cookies. It seems like a reasonable substitution, but I have never seen a recipe that contemplates it. To my knowledge, I’ve never seen an almond butter cookie. After a bit of research to compare the properties of peanut butter and almond butter, I was convinced that I could swap one for the other without much fanfare. I’m thrilled to share that it worked; after a few trials and tweaks, I think I’ve come up with a really satisfying cookie. 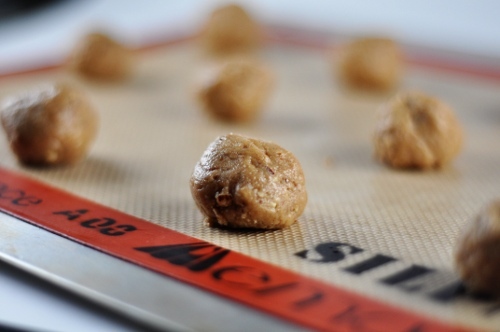 In true peanut butter cookie fashion, the dough provides an ample yield, making this a wonderful option for holiday baking and gifting. 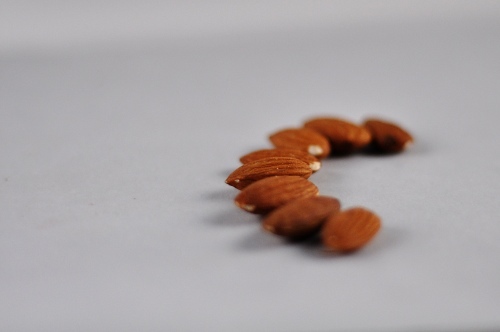 You can omit the toasted almonds if you wish, but I think they lend something lovely to the final result. You can also swap them out for ¾ of a cup of semi-sweet chocolate chips for a chocolate chip cookie that will blow your cookie-loving mind. 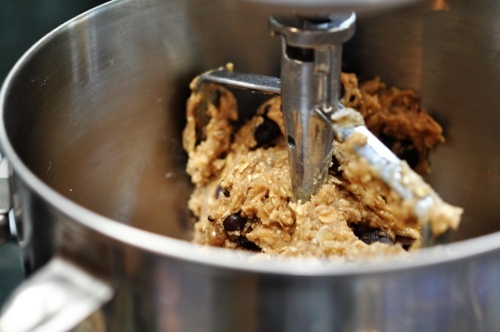 You will, I’m sorry to say, discover that the dough is perhaps the loveliest, richest, most craveable cookie dough you’ve come across in a long time. I recommend making these when everyone else is out of the house, lest you find yourself in competition for who gets to lick the beaters. I lost my mind while studying for the bar. Sort of. For the uninitiated, bar study is a long, lonely process that readies you, in part, for the actual exam by making you so vomitously tired of the studying that you arrive on test day with a head so swimming with “let’s just do this thing” that you forget to be nervous. One of the few unscripted days in our agenda that summer was July 4. Overwhelmed by the promise of an utterly free day, I decided to make things. Two things, to be exact. I made the chuppah for my wedding, and I made a fruit buckle. The former took about 14 hours that day, and another 20 hours the week before the wedding; the latter took about an hour and made for a lovely breakfast. Even today, I can’t quite explain why I found it important, nay, necessary to make the canopy for our chuppah. Nor can I explain why I thought it would be a good way to learn to quilt. And, even when pressed, I come up completely empty-handed when it comes to explaining how my calculations that day resulted in a chuppah canopy that is substantially larger than a king-sized bed. Apparently, I wanted to make sure we had room to both get married and do the Highland Fling underneath its gentle, convex arc. The ladies at the quilt shop were not particularly convinced that this project was going to be a success. I think I explained the whole venture about 8 times, though several of those iterations were spent describing How a Jewish Wedding Works to these septuagenarian Protestant women. In the end, we figured it out. They sent me on my way with a bag full of quilting tools, a bundle of gorgeous fabric, and good wishes underscored by a Germanic skepticism that’s undetectable to those who haven’t spent quality time in the Midwest. I still owe them a picture. I think the fact that I stuck with the quilting until the end really illustrates the insanity that flourishes during bar study; when faced with a free day, I shunned the temptation of naps and television in order to work my fingers to the bone and give myself a neck cramp that lasted for the ensuing two months. Still, 14 episodes of Law & Order later (I studied for evidence by shouting out objections throughout the trial scenes), I had made enough progress in piecing together the quilt squares that turning back was impossible. It was a devil’s bargain, bound up in fat quarters of gold calico. The buckle, on the other hand, was a no-brainer. As I have mentioned here before, my mom is an excellent cook. So when she calls me and says “I’m sending you a recipe; I think it’s the best thing I’ve ever eaten,” I listen. The bakery cupcake phenomenon kind of escapes me. It highlights my fleeting disconnect from people who don’t see cooking as Something You Do. Living in Los Angeles, I’m within each reach of at least a dozen bakeries with beautiful and famous cupcakes…but I’ve never been to any of them. My reasons are two-fold. First, the few I’ve had have been fine, but not great. It’s not that they’re bad, exactly, they’re just not something I’d go out of my way to track down. Second, I can’t fathom paying someone several dollars for a single cupcake when I can make piles and piles of them at home with the staples in my pantry and fridge. However, I wholeheartedly support the cupcake movement, such as it is. Tiny cakes that can be dressed and frocked to suit the wildest and mildest palates alike are whimsical genius, in my best opinion. Cupcakes are simply fun. It has been delightful to see something so fun and so manageable at home become so broadly popular recently. I only wish I could convince more people to make their own. 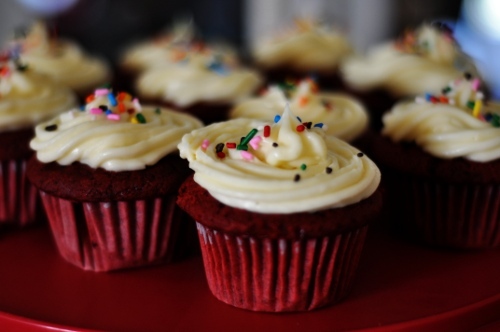 Do you want to know the secret to true cupcake perfection? Take an unfrosted cupcake and slice it in half on its horizontal axis so that you have top and bottom pieces that are of roughly equal thickness. 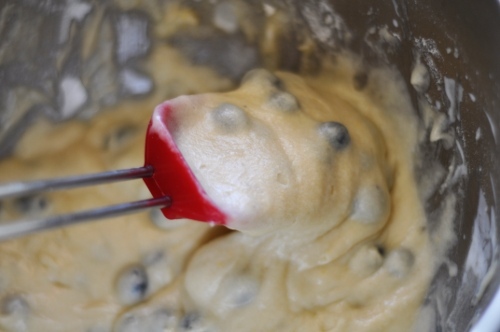 Next, spread a generous layer of frosting on the bottom layer and set the top layer on top. Frost the top as you normally would. Carefully spread a final layer of frosting around the sides and voila, a tiny layer cake for one. Enjoy with a fork. Of course, cupcakes in wrappers are also lovely. I made these Red Velvet Cupcakes for a friend’s birthday a few weeks ago when she told me her list of cake likes include lemon, chocolate, and cream cheese, in no particular order. Red velvet has experienced a bit of a renaissance in the past two years or so. No longer a regional staple of Southern birthday parties, it has gained a place in this new canon of cupcake frippery. I think it brilliantly exemplifies the genius of cupcakes. Here is a hyper-pigmented, sugar coma-sweet confection, packaged for one. It’s Dolly Parton as a dessert. A perfect platform for its flavor foil, frosting energized by the tangy snap of cream cheese; a perfect symbol for our national sweet tooth. 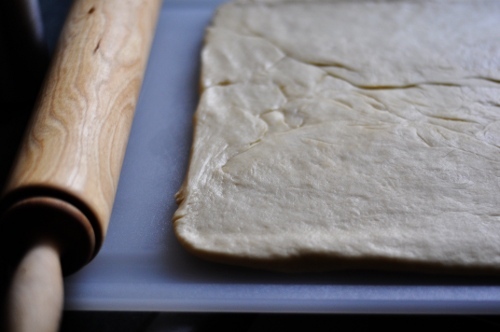 If you don’t have a pastry bag for piping the frosting, don’t worry about it. You can do a swell job with a dinner spoon. 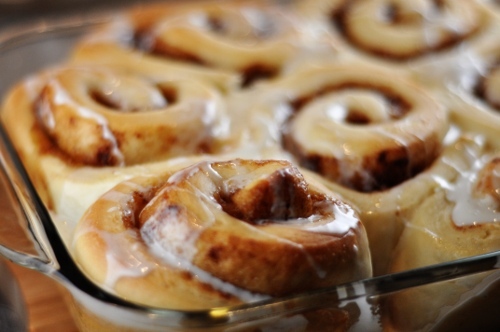 Load up the spoon with frosting. 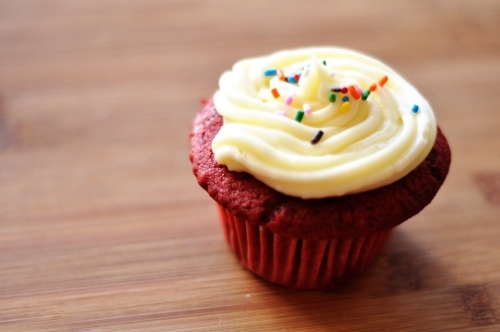 Holding the spoon in one hand and the cupcake in the other, set the spoon down on the center of the cake and rotate the cupcake in one, clean circle so that the frosting sweeps the whole top. Touch up as needed – you’ll end up with a lovely look. I offer you a pair of recipes to answer the age-old question “oh my goodness, what on earth was I thinking buying all of these lemons and what the hell am I going to do with them?” Oh Costco, how often you force me to summon the wellspring of my kitchen charisma so that I may flick it, liturgically, on the remnants of your bounty lest we commit the sin of food waste. This is a sorbet with two faces - think of them as fraternal twins. The first twin is pleasant, fun, easy-going. Interesting, but never controversial. She’s the kind of gal you can invite to any gathering with confidence that she’ll probably get along with most everyone. She would always be there to help you move, but probably wouldn’t be up for a spontaneous trip to Wendover. Her sister, on the other hand, is one of those people who is consistently described as a “firecracker” and with good reason. She is always intense, always the one ordering another round of shots and challenging you to a taco-eating contest. She probably owns leather pants. So, too, are the two preparations of this sorbet. Both are perfect, refreshing ways to bid adieu to summer, but the latter is rather intense because it derives quite a bit of extra citrus flavor from the alternative approach to the simple syrup. If you go this route, aim for substantially smaller portions or you will end up with a totally stripped tongue. 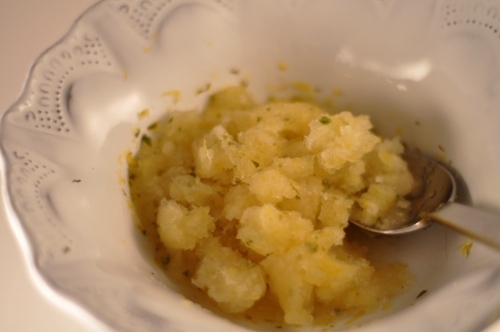 The candied lemons and limes are delicious in their own right and worth a try even if you don’t use the syrup to intensify your sorbet. They are sensational atop a bit of citrus-glazed salmon. In a small saucepan over medium-high heat, bring the water and sugar to a boil. 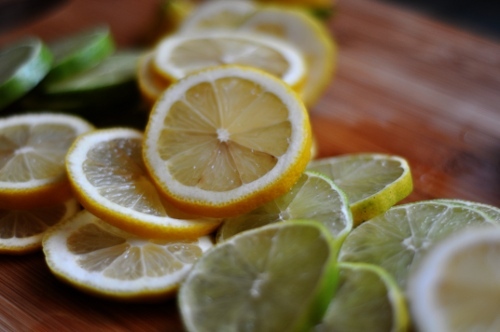 Gently drop in the lemon and lime slices and reduce the heat to medium-low. Cover the pan, and simmer gently for 8 minutes or until the peels begin to look waxy and translucent. Remove the pan from the heat. 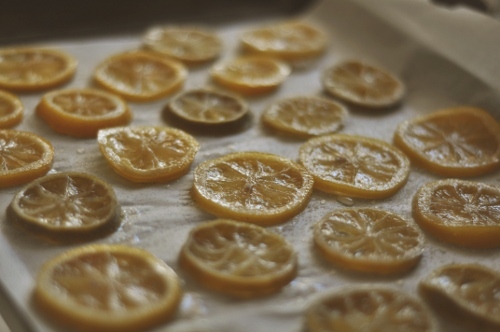 Use a slotted spoon to transfer the slices one at a time to a parchment-lined baking sheet to cool and dry. Reserve the liquid from the pan. 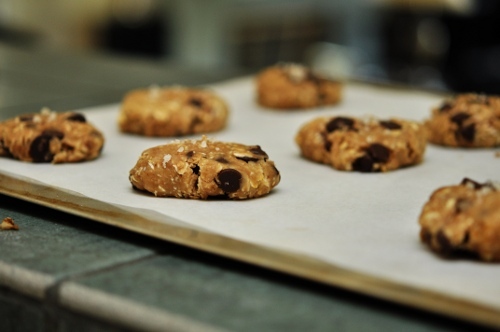 After 30 minutes, carefully lift the parchment paper (with the slices intact) from the baking sheet and set aside. 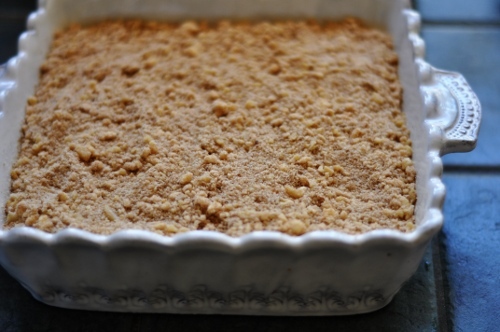 Line the baking sheet with a fresh layer of parchment and sprinkle with a layer of granulated sugar. Gently transfer the citrus slices to the new parchment (I used a pair of tongs) and sprinkle with a bit more granulated sugar. Cool completely, and store in a sealed container in the refrigerator. Bring the sugar and water to a boil in a small saucepan over medium-high heat. 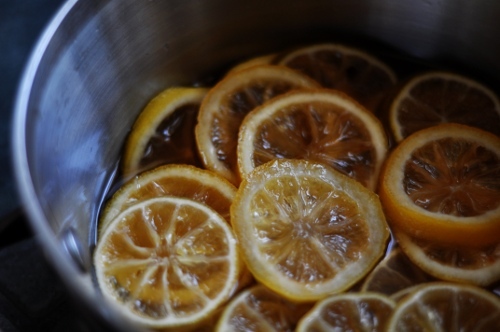 Boil for 5 minutes, remove from the heat, and allow it to cool for at least 10 minutes. If you are not using the reserve syrup from the candied citrus above, skip the remainder of this paragraph and go to the next step. Measure the reserve syrup in a liquid measuring cup with at least a 2-cup capacity. Note the quantity, and add enough of the plain simple syrup you just made to bring the total liquid to 1 ¾ cups. Store the remaining simple syrup in a sealed container in the refrigerator and use to sweeten lemonade, mojitos, whathaveyou. Combine the syrup, juices, zest, and chopped mint in a plastic or earthenware container and mix well. Cover it and place it in the freezer. In 45 minutes, the edges will be starting to freeze. Give it a good stir, taking care to scrape down the frozen bits along the edges, and return to the freezer. Continue checking on it and stirring well every 45 minutes or so until it’s firm. This will take anywhere from 2 to 4 hours, depending on how much you let the syrup cool when you took it off the stove. If you forget the interim stirring, eh. It will still be fine. Serve with a slice or two of candied citrus on top. The Salty Spoon is powered by	WordPress 2.7 and delivered to you in 0.439 seconds using 22 queries. All writing and photography © 2009 unless otherwise indicated. All rights reserved.